I was on my stomach, in the mud, hanging at a 45° angle reaching down the side of a creek bed, to a spot below me that I couldn’t see – trying to grab a dirty water bottle stuck in the muddy bank, half submerged in water…all for my 3 1/2 year old environmentalist son. How did I find myself here you might ask? 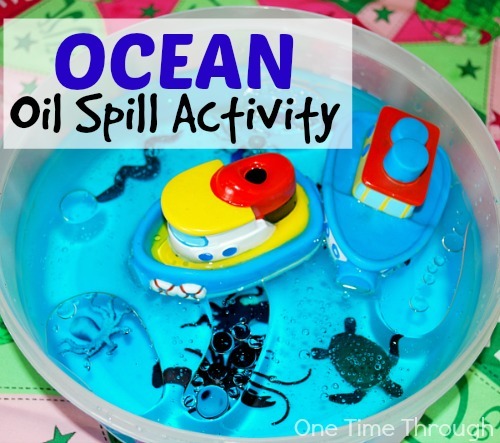 Well – I guess it has something to do with all the clean water activities we’ve been doing at home lately. We have been investigating water pollution, where clean water comes from, and how it gets cleaned at water treatment plants! 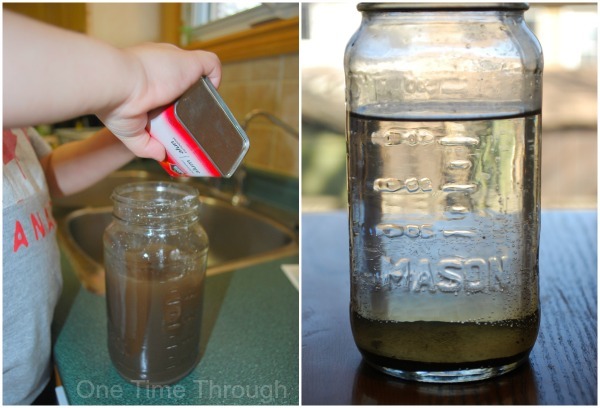 Today, I’m going to share with you some of the fun water pollution activities we’ve been doing at my house. 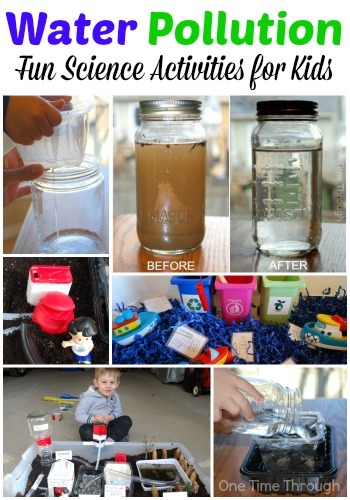 You might want to try these too with your kids! Amazon Affiliate links included in this post. See our Disclosure for full details. 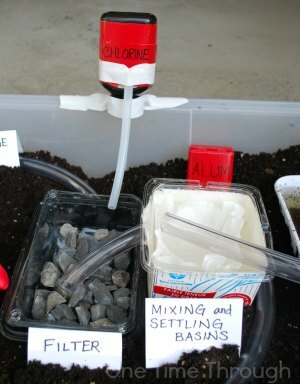 My son first became aware of the problem of water pollution when I created a hands-on polluted ocean sensory bin for him last year. 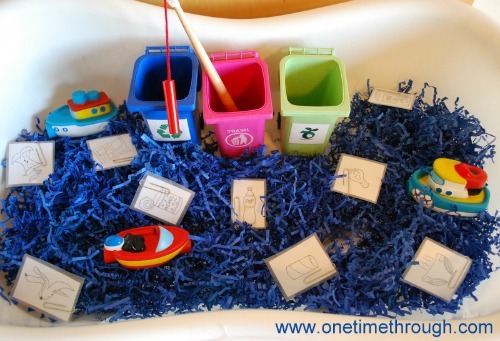 After looking at pictures of the Great Pacific Garbage Patch together, Onetime spent time at home “fishing” garbage out of his sensory bin ocean and learning where that garbage could have gone instead. We also did a lot of learning around the difficulties of cleaning ocean water when there is pollution. Check out this post to try this activity. 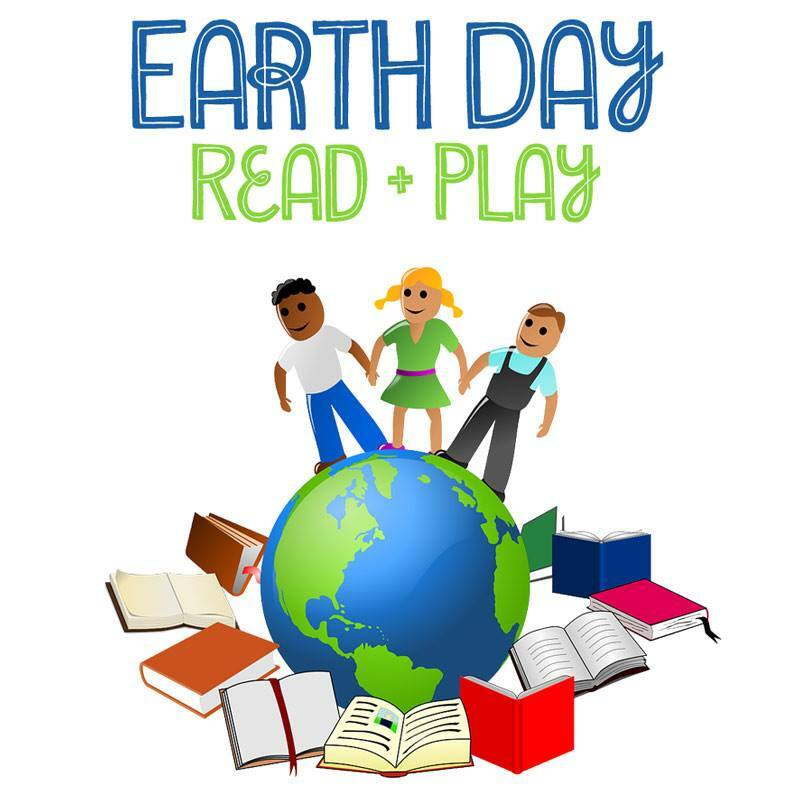 More recently, we read a fantastic book together called The Magic School Bus At The Waterworks and it has been the starting point to learn all about where we get our clean water from, and how it is cleaned. Once kids gain an understanding of where our fresh water comes from, and how it is a limited supply that gets recycled over and over again (and how we have to clean it over and over again for our use! ), they naturally come to want to protect our water sources from pollution. The Magic School Bus book above is a great place to start educating kids aged 2 to 20 about water! 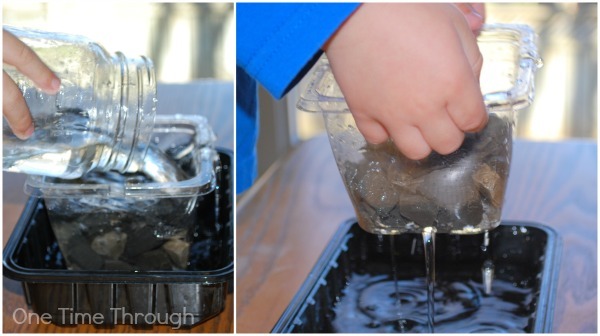 Its fun and funny story (along with tons of scientific facts) teaches about the water cycle as well as evaporation, condensation, and rainfall. The characters in the book shrink down to the size of water droplets and get to move through the cycle and then into a reservoir where they begin the process of being cleaned and treated in a waterworks before returning to their school through the bathroom faucet. After reading the book together a few times, my son started asking all kinds of interesting questions about the water treatment process. So – we decided to do some hands-on activities to learn more. To begin our investigation, we headed to the local pond to get a “dirty water sample.” Then, we just followed the water treatment steps we learned about in our book, using supplies we had at home! By the way, when we started this activity, we didn’t know the proper names for the cleaning steps, but after checking out this site, we now knew what to call them! To begin our cleaning, we found some Alum in our spice cupboard and Onetime shook some (maybe a couple tablespoons) into our pond water sample. Then we shook it up – just like it would in a Mixing Basin of a waterworks. 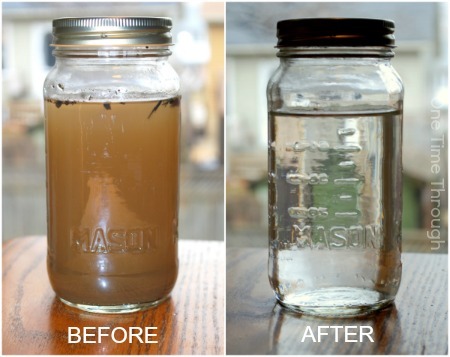 When we returned to look at our sample, we were astonished to see how well the alum had cleaned our water! In a real water treatment plant, the added Alum forms clumps with the dirt, which is now called “Floc”, and pulls it down to the bottom of the basin. Our process worked really well too! The next step in cleaning is typically to pass the water through a Sand and Gravel Filter. We didn’t have any sand, but we picked up some clean gravel outside and added it to an empty plastic berry container with holes on the bottom. When we looked at our water sample after the gravel filter, we still saw some small specks of dirt and we talked about how the sand likely would have caught those small pieces. Instead of using sand, we decided to try using a coffee filter to catch these last small pieces. We just placed the filter inside the berry container again and repeated the process. 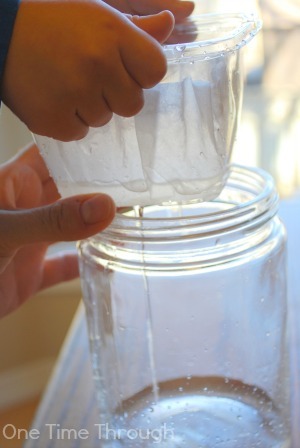 If you have sand, you could try putting some scoops inside a coffee filter and running the water through both. Our water came out looking so clean – it looked good enough to drink. But – we then talked about things that might be in the water that we couldn’t see! In the Magic School Bus book it talks about how Chlorine is often added to water to disinfect it. Onetime and I talked a bit about germs and how they are invisible (something we’ve talked about many times this winter when washing our hands!). Still – our process made a huge difference to both the look (and the smell!) of our sample. Don’t you think? After our water cleaning fun – Onetime had even more questions! “Where does the water go now?” and “How does it get to our house?” etc. so we decided to build a model of a water treatment plant together to help answer some of these questions! 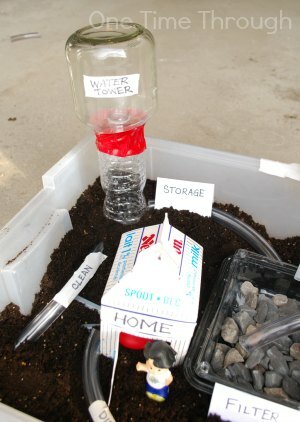 We started by placing our “reservoir” at one end of the bin and surrounding it with soil. We did this activity outside so the mess would be negligible. We also collected pinecones and evergreen sprigs to represent trees around a reservoir that are planted as a screen to keep leaves and other garbage out of the water (we learned this in our book!). 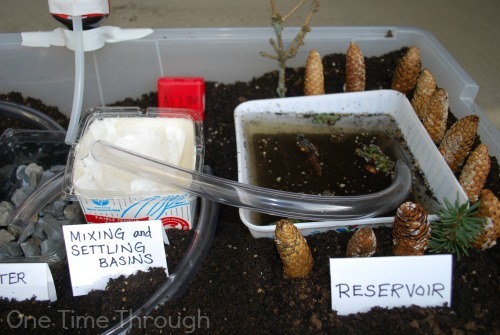 Beside our reservoir, we placed our Mixing and Settling Basin (along with our coffee filter screen) and our Alum. We cut off a section of tubing to represent the pipes traveling from one to another. Next to that, we placed our Gravel Filter. We also rigged a “Chlorine” vitamin bottle with some tubing to represent how the filtered water would then be disinfected. I thought we were done at this point, but then Onetime asked – “How does the water get to our toilet?” and so we made a little toilet out of a coffee creamer lid and a spice can and ran pipes into the house to the toilet! From there, the next question was – “Where does the water go from our toilet?” and we finished the cycle by laying another pipe (labelled “Dirty Water”) back to the treatment plant! As you can see, we labelled all the steps together and I was amazed how much of this Onetime really understands at 3 1/2! Building this model really seemed to explain a lot of things to him and we had a LOT of fun doing it together.Although we really couldn’t make our model a working one, Onetime didn’t seem to mind. We filled our reservoir with dirty water and just enjoyed trying to pour it through the pipes to the different areas. So what does water treatment have to do with water pollution? Well – now that Onetime has an understanding of how water moves through our environment and where our clean water comes from, he seems to have developed a much better awareness of the importance of keeping our water CLEAN! While visiting the neighbourhood creek the other day, he noticed all the garbage stuck on the bottom and seemed really disturbed by it – thus the request to retrieve the impossible water bottle – along with a variety of other pieces of garbage we saw. Looking down into the sewers on the street, he pondered how they would make their way to the treatment plant. Onetime also insisted we go the library to get some books out about water pollution – where we learned more about oil spills, farm runoff, and water pollution from factories. 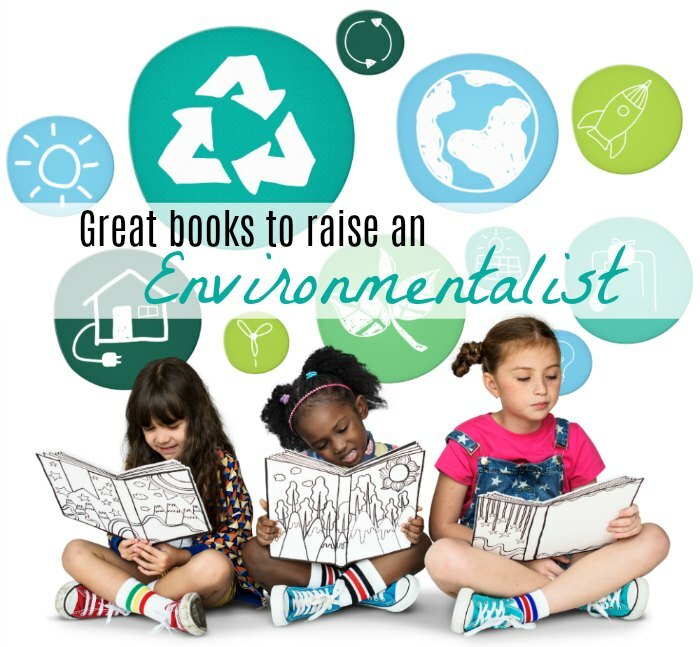 Check out my amazing list of environmental books by clicking on the picture below. With his newfound understandings, Onetime is starting to make all sorts of important connections about the importance of taking care of one of the Earth’s most valuable resources. 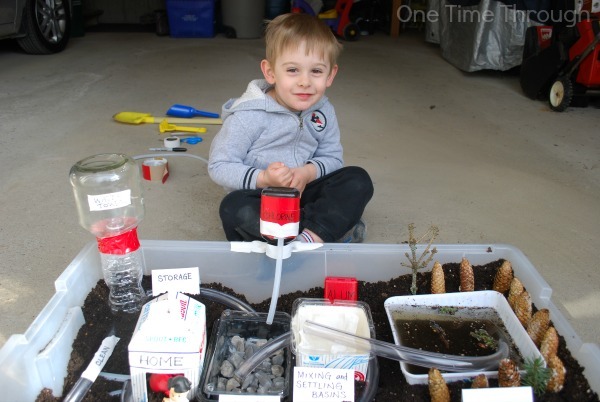 These activities were great fun for him and the beginnings of a young environmentalist. Seeing his budding awareness of and concern for our water supplies, gives me hope for our future. Now, we just have to show our model to ALL the kids in the neighbourhood! 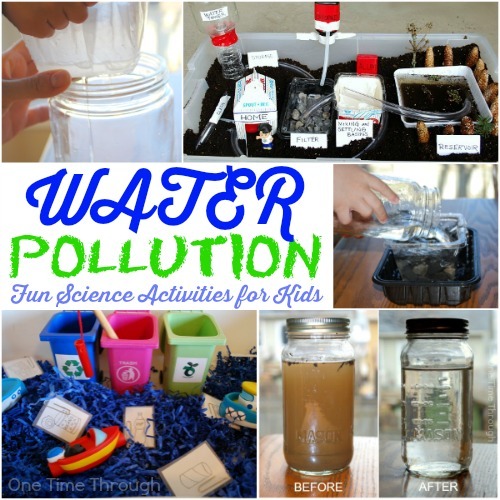 If you’re looking for even more pollution activities for kids – check out this awesome collection of ideas over at Every Star is Different. 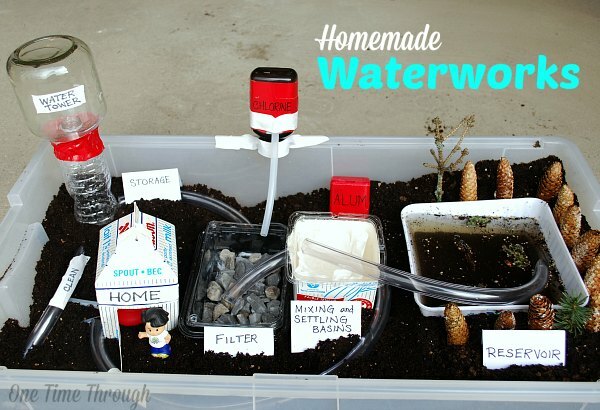 She’s got Montessori inspired pollution related kids activities for water, air and land pollution! 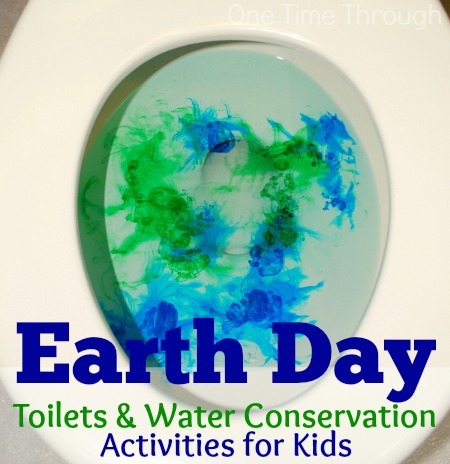 Learn about the importance of conserving water by exploring toilets at home in these fun activities. Along the Way has an easy and fun experience that will help kids realize how difficult it is to clean up polluted water. 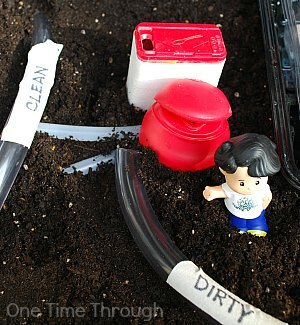 Getting Messy with Ms Jessi has a super simple activity that will help the kids see the impact of trash on clean water. Your water treatment plant is SOOOOO AWESOME! Love it. Thanks so much Anne! Lots of fun to make together. Thanks for dropping by! This is so thoughtful and well laid-out. I’m excited to share it with my readers! Thanks a lot Jennifer. I appreciate you stopping by!